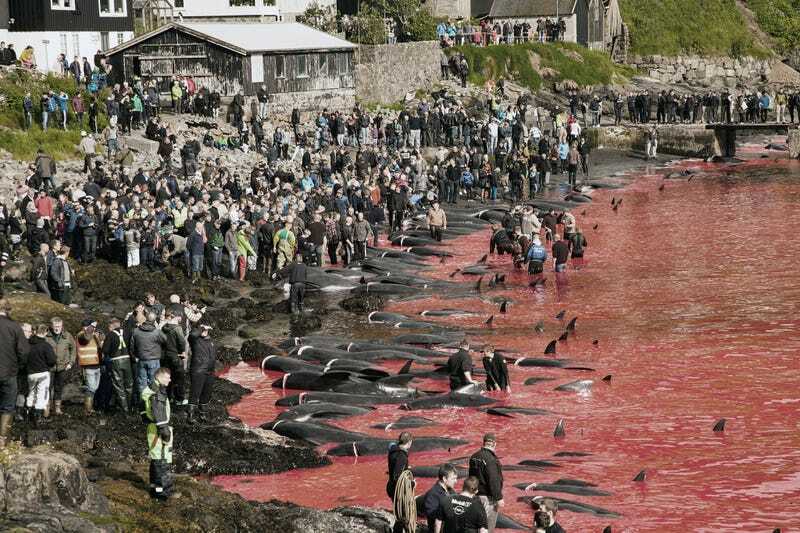 The Faroe Islands is one of the few places left on the planet where pilot whales and dolphins are slaughtered for meat. Locals claim that the hunt is sustainable, a cultural tradition, and is no worse than factory farmed animal slaughter; conservationists condemn the hunt as cruel, unnecessary and unsustainable. So, which is it? The Faroe Islands is a self-governing archipelago located between the U.K. and Iceland that is part of the Kingdom of Denmark and home to about 50,000 people. Because the islands are remote and quite barren, the Faroese have relied on the ocean, and specifically pilot whales, for food, blubber and other biomaterials for about 1,000 years. While certain elements of the whale hunts (called grindadráp, or grind) have changed with the invention of technology – most notably motorized boats and radios – the overall process hasn’t changed all that much over the millennium: driving pilot whales into a shallow bay where they’re killed with knives. The images of the hunt are disturbing: men waste deep in the bloody ocean, pulling whales to shore with metal hooks; blood spurting from knife wounds like scarlet blowholes; pilot whale carcasses laid out side by side on cement lots, guts spilling out. For conservationists, the brutality of the hunt has long been an issue. “One of the key things about the hunt is that it is inherently cruel,” explained Jennifer Lonsdale who, together with the other co-founders of the Environmental Investigation Agency, traveled to the Faroe Islands in 1984 to compile one of the first full documentation of the hunt. Joensen explained that after a grind, he took home about 150 pounds of pilot whale meat, equivalent to about $1,000. For conservationists, the argument that whaling is no worse than farmed meat doesn’t justify the cruelty of the hunt. “I don’t know if I can really say that one is worse than the other,” said Lonsdale, referring to raising pigs for slaughter and hunting pilot whales. “But I also don’t think you can say that one is justifiable because the other is justifiable, and there’s cruelty associated with both of them.” She also pointed out that as the Faroe Islands isn’t isolated anymore and imports food and goods from across the world, the Faroese no longer need to rely on pilot whales for their meat. “It isn’t a matter of survival anymore,” she said. While the other major whaling nations – Iceland, Japan and Norway – have commercial whaling industries, no one earns a living whaling on the Faroe Islands. Instead, local residents are some of the main participants in a grind. The hunts also aren’t really organized in advance, and take place only when the opportunity presents itself: first a pod of pilot whales needs to swim close to shore, and near enough to one of the 23 beaches on the island that are approved as landing sites; then the weather has to be right: calm enough to allow the hunters to go out in their small boats; and lastly, the local sheriff has to give approval for the hunt to go ahead. There’s no maximum annual quota enforced across the island and most of the decisions regarding the grinds take place at the local level; one of the largest factors considered is whether there’s a surplus of demand for pilot whale meat in the community. This opportunistic and loosely regulated hunting style means that the number of pilot whales caught and killed varies significantly from year to year; for example, in 2009 less than 500 pilot whales and dolphins were taken, while the next year over 1,000 pilot whales and dolphins were killed. The average, over the past three centuries, is a little over 800 pilot whales and about 75 dolphins each year, according to a 2012 study. With these figures in mind, the Faroese claim that the grinds aren’t negatively impacting the region’s pilot whale population. According to the Faroe Islands official whaling website, “scientists estimate that the pilot whale population in the eastern North Atlantic is about 778,000 whales, with approximately 100,000 around the Faroe Islands.” And, given that “the Faroese hunt on average 800 pilot whales annually,” the grinds are sustainable. The Faroe Islands’ population estimates do line up with those of the International Union for Conservation of Nature (IUCN). However, the last population survey for pilot whales in the area was conducted in 1997, and pilot whales’ conservation status is designated by the IUCN as data deficient, meaning that there isn’t enough information to determine exactly how threatened they are. Over the years, as the Faroese have stood fast to their tradition of whaling, they’ve faced increasing opposition from conservation groups. One of the most active organizations is Sea Shepherd, which is famous for using aggressive but effective methods to dissuade whaling across the globe. In 2014, Sea Shepherd began using the Faroese’s own tactics against them: while the Faroese use boats to herd the pilot whales into shore, Sea Shepherd used their boats to shepherd the pilot whales back out to the open ocean. This tactic proved to be highly effective: in 2014, less than 50 pilot whales and zero white-sided dolphins were killed; the year before 1,104 pilot whales and 430 white-sided dolphins were killed. Sea Shepherd’s method might have been too effective; in 2015 the Danish Navy was called in to help the Faroese and protect the grinds. According to Sea Shepherd, Danish boats blocked Sea Shepherd boats from entering Faroese waters, and police forces seized boats and arrested crew. There is now a law in place which makes it illegal to interfere with a grind. Still, Sea Shepherd is far from giving up; in May of 2017, the organization filed an infringement proceeding against Denmark with the European Commission. The claim argues that as the killing, harming or harassment of Cetaceans (which includes pilot whales and dolphins) is banned across Europe under the Habitats Directive, Denmark, through its facilitation and protection of the grinds, is violating the Habitats Directive. If Sea Shepherd is successful, the Danish Navy will no longer be allowed to provide naval support and protection for the grinds, and conservation groups will be able to restart activity on the island. Such a ruling would also likely be an embarrassment to Denmark, and might precipitate a change in their attitude towards the Faroe Islands. It’s important to note that while the Faroe Islands is part of the Kingdom of Denmark, it’s not part of the European Union, and so the infringement proceeding is against Denmark but not the Faroe Islands directly. Although international pressure continues to grow against the grinds, the hunts may be stopped for another reason altogether: contamination. Alarming levels of toxins, including PCBs and mercury, have been found in whale meat and blubber in recent years. Among the slew of potential health hazards linked to these toxins are cancer, infertility, and suppression of the immune system. The growing scientific documentation has, during recent years, given rise to the anticipation that the time was approaching when it would be appropriate to recommend against any human consumption of pilot whale meat and blubber. From the latest research results, the authors consider that the conclusion from a human health perspective must be to recommend that pilot whale is no longer used for human consumption. Pilot whales are far from the only marine animals that are experiencing extreme levels of contamination. A study published in the journal Nature in 2016 analyzed the blubber of over 1,000 European dolphins and killer whales for traces of PCBs. The report found that PCB contamination in these animals “greatly exceed concentrations at which severe toxic effects are known to occur,” and that “despite regulations and mitigation measures to reduce PCB pollution, their biomagnification in marine food webs continues to cause severe impacts among cetacean top predators in European seas.” Just last year, a killer whale was found washed up on a Scottish island with some of the highest levels of PCBs ever recorded. The contamination and the advice of the Chief Medical Officer seem to be chipping away at the popularity of pilot whale meat; while it has traditionally been a staple of the Faroese diet, pilot whale is transitioning to the role of symbolic food for special occasions. Still, the grinds are far from a thing of the past; since 2000, over 14,000 pilot whales and dolphins have been killed and already 617 pilot whales and 61 white sided dolphins have been killed this year.